Solange should definitely kick singing to the side, because this chick has major talent in the song-writing and publishing game. Solange Knowles recently inked a worldwide co-publishing deal with EMI Music Publishing. All though her albums have failed to gain widespread attention she has blown up behind the scenes. 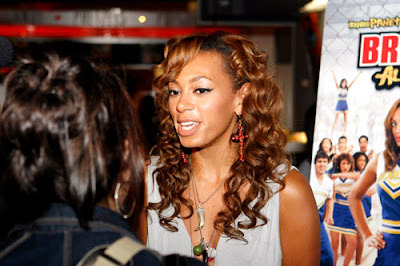 She has written or co-written hits for Destiny's Child, Kelly Rowland, Michelle Williams, Trin-I-Tee 5:7, and Beyoncé. Her most recent lyrical hits include Beyoncé's "Get Me Bodied," "Upgrade U" and "Flaws and All" from the multi-platinum selling album, B'Day. Yes, SOLANGE wrote lyrical greatness of "Upgrade U". Knowles is currently in the studio recording her sophomore CD, Solange & The Hadley Street Dreams, a collection of songs all co-written by Knowles, with appearances by Q-Tip and Bilal. As much as we hate on Solange her time will come. She will definitely blow up and probably have a longer career than B. Producers and songwriters last longer in the game then most artists. Kudo's to this young entity.